Have you ever wondered what’s happening behind the closed doors and drawn curtains of your neighbour’s house? Ever wished you could sneak into their abode and reveal the inner workings of their secret lives? In Hello Neighbor, you do just that. The premise of this stealth horror game is a simple one. A young boy, innocently playing football in the street, passes his neighbour’s house and, upon hearing screams, he witnesses the frantic locking of the basement door and decides to investigate. The neighbour (known only as Mr Peterson) is clearly a troubled man, one weighed down by the secrets he keeps. As he smashes through windows, fortifies his house to the extreme and patrols the gardens to prevent you from entering his basement, you can’t help but guess at his dark motives. The neighbour is made more menacing by his AI programming, which allows him to learn from your actions. Enter the house from the same window and it will soon be boarded up. Security camera’s will monitor frequently visited areas of the house and, when pushed to the extreme, Mr Peterson will lay out bear traps. While these obstacles are not inherently scary or even challenging to overcome, they do emphasise the fact that you are part of an intricate game of cat and mouse. As the young boy, you have no means to truly protect yourself from Mr Peterson, but normal household items can be used to slow down and deter your relentless neighbour as he chases after you. However, item management and even interaction with objects is clunky and slow. You’re only able to carry four items at one time, including essential items such as keys. This limitation means that you will have to backtrack to earlier sections to collect crucial items that you may have left behind. As the game progresses Mr Peterson’s house slowly becomes more intricate until new rooms resemble something akin to the Finch household from What Remains of Edith Finch. The small blue house where the game begins is tight and confined and running into Mr Peterson is common; something that happens so frequently that supposed horror elements become tedious. A horror game is made successful by well-timed shocks and surprises, but the developer really drops the ball early on. 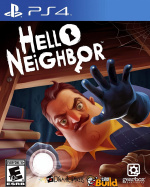 After you’ve been captured you’re placed outside the neighbour’s house with all the items you previously had, meaning that Hello Neighbor feels devoid of threat. Puzzle solving also plays a significant role in the game, but puzzles are largely nonsensical and overly complicated. Items which are used to solve the numerous conundrums are littered around the house, but the game offers zero insight on how and where to use them, which leaves you wandering around aimlessly hoping to stumble across a solution rather than working anything out. Additionally, there is one glaring negative present throughout the game which makes it feel like an unfinished product. Almost a year after its initial realise on Xbox, Hello Neighbor is still prone to extreme glitches and bugs which essentially ruin the game. Mr Peterson is supposed to be an intimidating man but bugs in his programming leave him frozen in one position, cause him to walk through walls and get stuck in corners, often allowing you to explore his house in peace, completely eradicating any tension. There are a few positives to note, however. 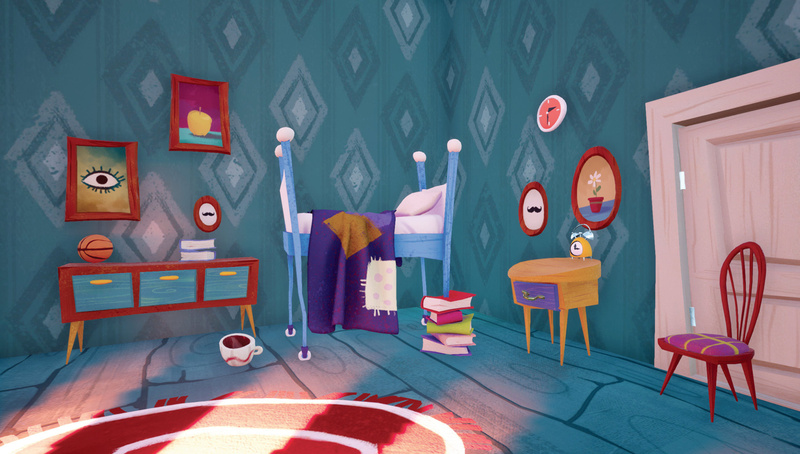 The quirky cartoon styling of the game is excellent, and sign posts with obscure text hint that Hello Neighbor is a game that subtly tackles real life issues such as dyslexia. This theme never becomes a main focus, but its presence in the game should still be noted and applauded. 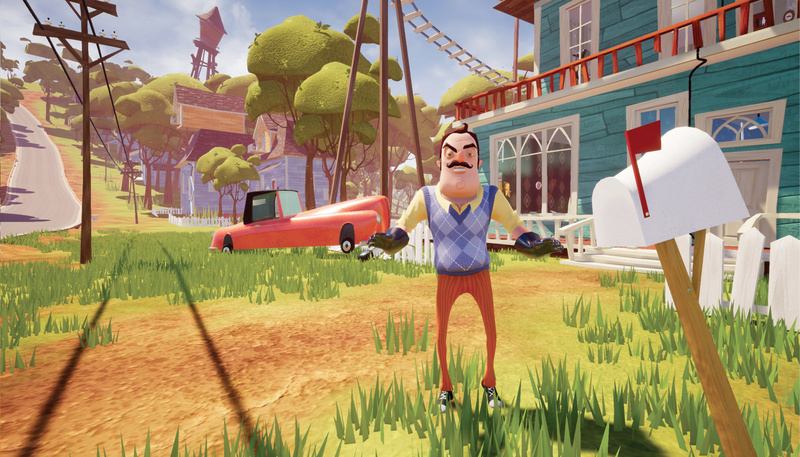 Sticking with Hello Neighbor takes a lot of patience and forgiveness. While the lure of the secret in the basement is a strong one, the glitches, complicated puzzles, and problematic AI all make for a giant slog. With improvements this indie could be a spine-tingling horror game, one which plays on deep childhood fears and leaves a lasting impression, but in its current state, we wish that we'd just stayed at home. I saw this game on the eShop (sorry), and it piqued my interest. I guess I can remove it from my wishlist. I can forgive odd design choices, not bugs. Thanks Rebecca, pretty cool! Wasn't expecting a higher score than this, honestly...to my knowledge this game is pretty meh! Classic example of a game with a brilliant concept and poor execution. The idea of invading a neighbour's house while they hunt you could be so, so good. This is a game that only really got popular because of YouTube. Doesn't look great to me. Could've been good. Warm welcome to the new reviewer. Enjoy your stay! Thank you @AFCC I was between a four and five but then taking into consideration the amount of time the game has been out it should not be as buggy as it is. Thanks @SegaBlueSky! I think that the AI implementation was both its success and its downfall. It's a shame really because it has such an interesting premise. You're most welcome @NintendoFan4Lyf. The bugs and glitches are a shame because the game is almost unplayable at times. 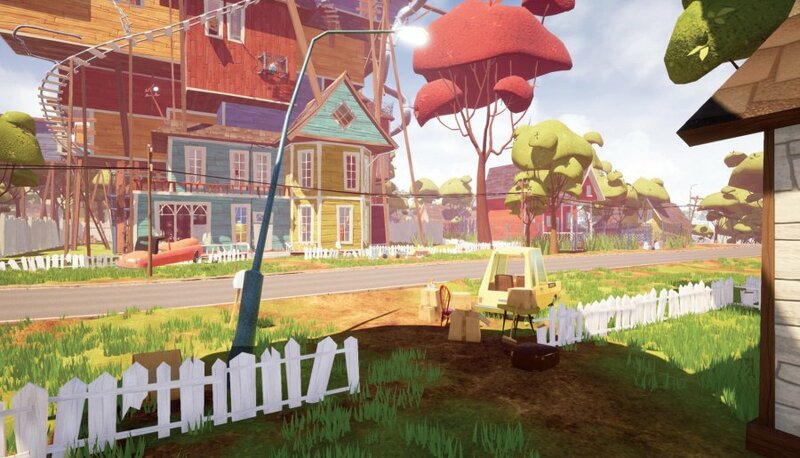 @RebeccaStow97 Maybe the game should be filed under edutainment - on what not to do with a game....or maybe it’s a cautionary tale for children to not bother their AI-controlled neighbors. Nice to see a familiar face from elsewhere, in this case words @RebeccaStow97. She's wrote some great Bloodborne articles over at SquareXO.co.uk, good guys over there people should check them out. As for the game, I'm a bit surprised cos it was hyped up quite a bit a year ago so it's a bit disappointing.